An electric heater has a one to one power to heat output, so for every 2 kW of heat you require 2 kW of electrical power. However, a reverse cycle (heating & cooling) air conditioner requires only 0.6 kW of electrical power for 2 kW of heat. How can that be?!! Well the reverse cycle (heat pump) takes free heat from the air. The fan forces air across an evaporator that contains very cold liquid refrigerant. The heat in the air warms the refrigerant and changes it to a gas. This gas is circulated by a compressor and the increasing pressure causes the temperature of the gas to rise further. The high temperature gas then goes to a condenser where the heat is transferred to the air. The refrigerant cools to a liquid and the cycle starts again. So the cost of heating the air is approximately one third compared to electric heaters. That is significant. Let us run some numbers in terms of dollars. On today’s energy costs (winter 2013) of 25 cents per kWh the 2 kW electric heater will cost 50 cents per hour to run. The reverse cycle air conditioner will cost 15 cents per hour. 1. The air is distributed evenly throughout the room. Daikin air conditioners have 3D air distribution that circulates the air to the corners. 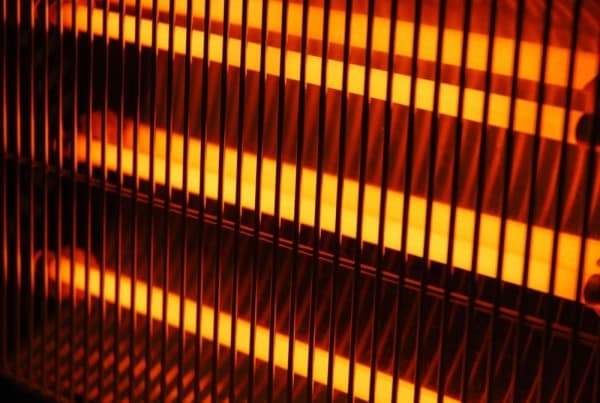 In the case of electric heaters it is hot near the heater and cold in the rest of the room. 2. Thermostatically controlled so no electricity is wasted by overheating. 3. The air conditioner can be set to turn on 30 minutes before your alarm goes off in the morning. You can get out of bed into a warm room for less than 15 cents per day. 4. In summer the air conditioner is used for cooling whereas the electric heater sits dormant in storage. 5. Electric heaters have safety issues. A 2 kW electric heater can overload electric circuits especially in older houses. Overloaded circuits can cause fires. In addition the high radiant heat close to the heater can cause clothing to catch fire. 2 Even temperature throughout the room. 3 Comfortable morning wake up environment by use of the timer or Smart Phone. Reverse cycle air conditioners are available in wall mounted, floor console and ducted air conditioning systems. If an electric heater is used in an older house then it is recommended that the switchboard and wiring be checked by a local electrician. Get in touch with Crown Power today, your experts in air conditioning and electrical services.